Home > Mother's Day Dinners! > Surf & Turf Dinners! > Ultimate Surf & Turf Dinner with Clam Chowder! The Ultimate Surf & Turf For Two! Four 5-6oz. Maine Lobster Tails, Two Huge 8 oz. Filet Mignon & Award Winning Clam Chowder for Two! 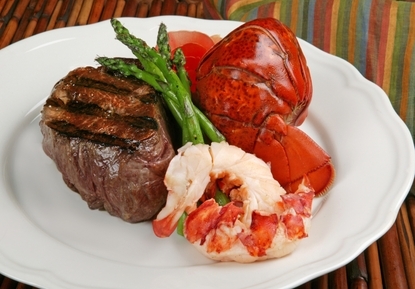 This Is A Great Surf And Turf Dinner Choice! Complete With Four 5-6oz.Maine Tails, Two 8oz.Filet Mignon, And Clam Chowder for Two! An Outstanding Affordable Seafood Gift Choice And Also A Great Gift Idea For Holidays, Anniversaries, Birthdays, or just a Great Thank You!! Really Great Dinner, came right on time and packaged well, the food was outstanding! This was like eating in a 5 star rest at home! LOVED IT!